The indefinite detention provisions of the National Defense Authorization Act (NDAA) managed to avoid mass public outcry as most Americans diverted their attention to end-of-year festivities. On Dec. 31, President Obama made a name for himself as the president who codified into law measures that permit indefinite detention without due process and trial for U.S. citizens. Much confusion has been garnered by the vagueness and ambiguity of the language of these provisions. But, Obama made one thing clear to soothe oppositional cries; he attached a signing statement to the bill assuring us all that indefinite detention would not apply to U.S. citizens—as long as he remains in office. Many Democratic Party supporters refer to Obama’s signing statement to exculpate the president and avoid real political analysis of the consequences of these provisions. A clarification of what’s contained in the bill, as well as its historical context, is necessary to fully grasp the impending threat to basic civil rights. The NDAA not only allocates $662 billion to national security and the endless War on Terror, and ramps up economic sanctions against Iran, but contains two provisions that grant the president and U.S. military the power to detain anyone they deem a security threat indefinitely and without a trial. Section 1021 of the NDAA allows the president to detain “covered persons” indefinitely “without trial until the end of the hostilities.” The broad language of these provisions includes a description of “covered persons” as including anyone who “substantially supported” groups that the U.S. is in conflict with, “or associated forces … against the United States or its coalition partners.” These terms are so vague that the ACLU and other civil rights organizations agree they pose a threat to constitutional rights. What’s to prevent future administrations from freely utilizing these powers against those who oppose U.S. foreign policy, support the struggle of the Palestinian people, or simply disagree publicly with the government? Further complicating the debate, Section 1021, while excluding indefinite detention for American citizens, applies it widely to citizens detained abroad or undocumented workers living on U.S. soil. But what augments confusion regarding the application of indefinite detention to American citizens is yet another confusing and ambiguous section of the law, Section 1022. U.S. citizens are excluded from the “requirement” of being detained but not from the possibility of indefinite detention! The language in these provisions is purposefully confusing in order to divide public opinion on the issue and prevent massive opposition to it. However confusing the language may be to some, the indefinite detention provisions of the NDAA are real, and they fit neatly into the American history of attacking civil liberties at home while whipping up sentiment for war abroad. The Palmer Raids were designed to arrest and deport radicalizing immigrant workers and leftists, occurring in the context of World War I and the Red Scare. The internment of thousands of Japanese-American citizens in designated “War Relocation Camps,” on the sole basis of their ethnic background, took place during World War II. The McCarthy-era witch-hunts were designed to whip up anti-communist hysteria in preparation for the Cold War. COINTELPRO, an FBI counterintelligence program, was purportedly created in 1956 to fight communism in the context of the Cold War, but would reach into the Vietnam War era and be used not only against the Communist Party and Socialist Workers Party but also against many civil rights, antiwar, Black nationalist, and other individuals and groups associated with the left—including Martin Luther King Jr., Malcolm X, Fred Hampton, and Bunchy Carter, to name only a few. It is within this historical context that we have to view the current assault on civil liberties and the implications it carries. The indefinite detention provisions of the NDAA are particularly frightening in light of recent Associated Press revelations of the NYPD’s unlawful surveillance and data gathering of the Muslim community in collaboration with the CIA. Since 9/11, the Muslim community has bore the brunt of government attacks under the pretext of the “War on Terror.” The government has wreaked havoc on entire communities through preemptive prosecution and contrived crimes by profiling Muslims as “predisposed to be terrorists” on the basis of their religious beliefs! In what have become the “largest domestic intelligence agencies” in the country, the NYPD has infiltrated mosques, bookstores, cafes, and institutions frequented by Muslims without any evidence of wrongdoing. AP reports sent a chill to civil rights supporters when they revealed the NYPD has been spying on Muslim Student Associations (MSAs) across the Northeast, including as far as Yale University in Connecticut, the University of Pennsylvania, and Rutgers University in New Jersey. Undercover agents reported on how often Muslim students prayed, monitored website activity, and even accompanied students on a white rafting trip, submitting names of students to reports compiled for Police Commissioner Kelly. Even before these revelations, the NYPD had a record of profiling entire communities, especially the Black community, through stop-and-frisk policies. The AP reports add to the list of grievances against the NYPD, including against their use of an anti-Muslim film, “The Third Jihad,” in training police officers. The widespread attacks on the Muslim community have triggered resounding public opposition throughout the country. In New York City, Muslim leaders from the Arab American Association of NYC and the Council on American Islamic Relations (CAIR) have requested the resignation of Police Commissioner Kelly. The Association of Muslim American Lawyers, with the support of over 40 Muslim and non-Muslim organizations, issued a statement requesting the investigation of the NY Police Department by the Attorney General. Muslim Student Associations issued public statements opposing NYPD’s spying on their organizations and requesting apologies. Local CAIR chapters in collaboration with peace and justice activists organized press conferences denouncing the NYPD’s illegal activity. Even the Yale University president publicly condemned the NYPD surveillance, and the Rutgers University AAUP-AFT not only demanded that surveillance of their campus cease but also an investigation of the NYPD’s demographics unit. However, despite efforts by Muslim organizations and their allies to call for investigations of unconstitutional New York police activities, Mayor Bloomberg continues to defend the department’s intelligence gathering activities. Under the pretext of securing the nation and protecting New Yorkers, Bloomberg legitimizes racial, ethnic, and religious profiling of entire communities. The rise of anti-Muslim legislation is a symptom of the attack on all of our civil liberties. Unlawful surveillance, entrapping, and preemptive prosecution of the Muslim community have reinforced stereotypical and false notions of Muslim people as a “threat” to the U.S. Such measures that isolate and demonize the Muslim community at home are used to fuel U.S. wars in the Middle East. By creating an image of Muslims as a “potential terrorist” threat, the U.S. government gathers support for its War on Terror at home and abroad. We are facing a huge battle to restore our civil liberties on many fronts, from police brutality on communities of color and Occupiers to fights over the right to protest. Therefore, we must respond to the attacks on the Muslim American community as if it were a direct attack on each one of us. Indeed, if this surveillance goes unchallenged, we all become more vulnerable to new encroachments on our political and civil freedoms. Recent efforts by national civil rights organizations such as the ACLU and CAIR in asking for investigations and accountability of the NYPD are important steps in the struggle to garner opposition to government attacks on civil liberties. However, these legal means are no substitute for the power of mass united movements in reversing McCarthy era tactics and defending civil liberties. In Connecticut, efforts to build a mass movement have already ensued. On Feb. 18, in Berlin, a coalition representing over 30 organizations met to initiate a campaign to stop indefinite detention. The meeting was sponsored by peace and justice organizations, civil rights groups, antiwar groups, and local Occupiers. Speakers included Steve Downs from Project SALAM, Cyrus McGoldrick from CAIR-NY, and Farzana Rahman from the Muslim Peace Coalition, to name a few. Over 100 people attended the meeting, representing the antiwar movement, occupy, interfaith groups and local Muslim organizations. Efforts seeking to form links between the anti- war movement and the Muslim community have also been fostered by the Muslim Peace Coalition in New York City, organizing rallies and protests in collaboration with the antiwar movement, Occupy, and the main NYC Arab, Muslim, and South Asian community groups—including DRUM, NLG-Muslim Defense Committee, and CAIR. Only by building a mass movement that transcends religious, ethnic, and racial confines to defend the Muslim community will we stop the attack on all of our civil liberties! Socialist Action stands in solidarity with the Muslim community in their fight for civil rights! An injury to one is an injury to all! Civil liberties for all! 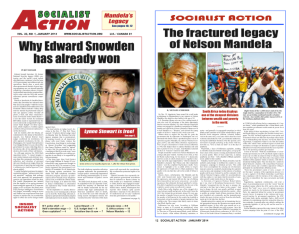 > The article above was written by Ana Noli, and first appeared in the March 2012 print edition of Socialist Action newspaper. Close Guantánamo with Justice Now!